A slice, 70 million light-years thick, taken from the Millennium Run. The overlaid panels zoom in each time by a factor of four. 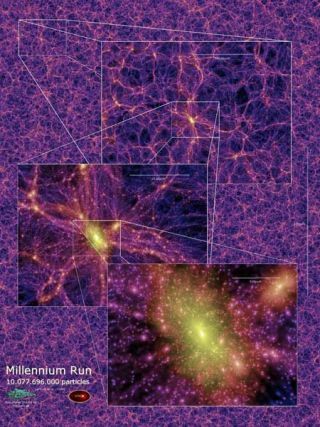 Ahighly detailed computer model has captured the birth of galaxies and giantblack holes. It lets astronomers follow the subsequent growth of thesemassive structures in the largest cosmological simulation to date. Theso-called "Millennium Run" took 28 days of intense computation togenerate its 25 terabytes (25 trillion bytes) of data. The simulation -named after the 2000-time-frame in which the idea was conceived - tracks theevolution of matter inside a cube 2 billion light-years on a side. A light-year is the distancelight travels in a year, about 6 trillion miles (10 trillion kilometers). "Oneof the main advances here is size, which does matter in this business,"said August Evrard of the University of Michigan. "We are able to connect the first structures in the universe with thegalaxies we see nearby." Thesimulation starts when the universe was 10 million years old and evolves it allthe way to the present - 13billion odd years later. The cube contains roughly 10 billion"particles" - each with the mass of a billion Suns. Thesecolossal blobs of matter interact gravitationally with each other incyberspace. Gravitywill cause some of the particles to merge. In the center of these matterclumps, galaxies can form, but exactly what type of galaxy will depend on thesize of the clump and the history of mergers. It would take a clump of afew thousand particles to house a Milky-Way-sized galaxy. Apaper describing the Millennium Run appeared in the June 2 issue of Nature. TheMillennium Run does not actually go into all the messy details of forming starsand accreting gas. Instead, it essentially provides the framework, orskeleton, for all that galaxy business by concentrating on the elusive darkmatter, which is the dominant form of matter in our universe. Thelight-emitting stuff - that we are all familiar with - only makes up about atenth of the matter. The other 90 percent does not react withlight. This dark matter has yet to be detected directly, butastrophysicists find it indispensable for explaining the cosmos. "Atpresent, cosmologists can simulate dark matter, which we can't see, better thangalaxies and gas, which we can," said Nickolay Gnedin from the University of Colorado in a separatecommentary. Darkmatter is easier to work with because it does not interact with anything,except through gravity. Although computing the gravitational interactionsof 10 billion dark matter clumps is no small feat, it becomes significantlyharder when you throw in the radiation and gas dynamics needed to make stars. Insome sense, then, the Millennium Run is just the first step in creating adigital universe. Once the dark matter "template" was finished,the international team of investigators - that calls itself the VirgoConsortium - was able to tack on a galaxy formation model, which basically toldthe computer where to stick bright, shiny things amongst the dark clumps. Isit possible to separate the dark matter evolution from galaxy formation? Evrard admitted that there are complications, butsimulations like the Millennium Run have compared favorablywith full hydrodynamical simulations, whichincorporate everything at once but are so computationally expensive that therepresented volumes are considerably smaller. Ofparticular interest in the "bright and shiny" category are quasars -the most luminous objects in the universe. They are believed to be giantblack holes - some of them billions of times more massive than our Sun - whichare gobbling up very hot, glowing material. Recentobservations by the Sloan Digital Sky Survey (SDSS) have found bigbooming quasars so far away that we are seeing them when the universe wasjust a tenth of its age. Making black holes this big, this early,had seemed implausible in the currently favored cosmology. "Yetwhen we tried out our galaxy and quasar formation modeling, we found that a fewmassive black holes do form early enough to account for these very rare SDSSquasars," said lead author Volker Springel ofthe Max Planck Institute for Astrophysics. Theseblack hole quasar candidates can be traced from when the universe was only afew 100 million years old, all the way to the present. If the simulationis correct, the first quasar galaxies later turned into the massive galaxiesthat now sit in the center of the biggest galaxy clusters. Thisfinding was not surprising, but the Millennium Run allows scientists theopportunity to watch the entire life cycle of these behemoth structures - aswell as other, more modest galaxy types. Oneadvantage of calculating the cosmicweb of dark matter separately is it allows you the freedom to exploredifferent ways of building up galaxies. "Thereally cool thing is that in the future, when the data is made public, you cango in and insert your own rules for galaxy formation," Evrardsaid. Thisis seen as a much more efficient use of computer time, as different researchers- and the ambitious amateur cosmologist - can use the dark matter skeleton fromthe Millennium Run to hang their own galaxy models. "Forthis reason, the simulation will have staying power," said Evrard. "Maybe not for amillennium," he joked, "but for a decade, at least, and perhapslonger." This article is part of SPACE.com's weeklyMystery Monday series.